I've said it before and I'll say it again: in my short time as a foodie blogger/eatery reviewer, nothing I've written has caused a bigger stir than my review of Boise Fry Company. To this day it's the only write-up I've done that has led to me being contacted directly by the proprietor of the business (an experience I wrote about rather excessively and introspectively here), though I'm still expecting a rock through my front window for my Pie Hole review at some point. That e-mail turned into several. I started this thing to document experience, but I didn't think I'd really learn anything. I have to admit I've learned a few things from talking to the Fry Guy (this is how I'll be referring to Boise Fry Company's owner from here on in, if I'm not using my name I certainly ain't gonna use his). I've learned that if you're going to specialize in fries, this is a pretty dark time of the year since potatoes are harvested in the fall and at this point have been sitting for months in warehouses. I knew this in the back of my head, but never really made the connection until it was pointed out to me. I have to admit that if I were in Fry Guy's shoes, I'd cut certain options from the menu, or at least make them seasonal, but I'm sure that would cause a revolt among the more old-fashioned faction of his loyal customers. In other words, you shouldn't expect to see me opening a BFC franchise in Meridian anytime soon. The Fry Guy also told me that they have recently changed the way their peanut oil is rotated. That along with the other knowledge he had imparted had added to my not already inconsiderable curiosity towards some of the less standard options on their menu, so when given the chance to be downtown recently, I decided to hit BFC's happy hour (small fries and beer are buy one, get one free from 4-6 on weekdays) . A crucial piece of information I took with me this time was that I would need to season my fries myself. My girlfriend told me recently that she hadn't added any of the available salts to her fries or the kids'. I can't fault her for this, she never really adds salt to anything, especially restaurant fries which do not normally need any extra salt. That being said, it certainly accounts for some of the lack of flavor (especially after that amazing burger and the duck fat and black truffle salt-infused Bourgeois) . I hadn't asked Fry Guy, but I'm guessing that little or no basic salt is added to the fries prior to serving so the customer can customize their order. Bearing this in mind, I decided to meet them halfway. 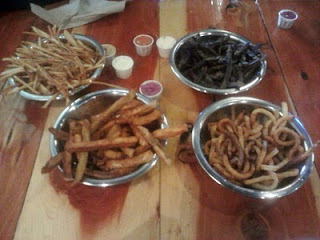 Accompanied by my mother and sister, we took advantage of the buy one, get one and got four varieties: shoestring russet, curly gold, regular-cut purple and homestyle sweet potato fries. I immediately headed to the condiment station so I could get some flavor on these while they were still hot. On my previous visit I hadn't needed to worry about the salts since The Bourgeois comes pre-salted. Now I stood looking at half a dozen salt shakers, everything from vanilla salt to vinegar salt to smoked salt and having no idea what to do. In the end, I panicked and everything got hit with the rosemary salt (rosemary is a big weakness of mine) with the exception of the sweet potato fries. I think I might have actually hit every dipping sauce option though. So, let's break this down by fry, shall we? Russet (shoestring cut) - I knew when I walked in that I was going to order these. Despite the fact that I now knew this type of potato is problematic at this time of year, I couldn't help but wonder how such a thin cut of such a difficult spud would fare with the new oil rotation policy. They were more toward the brown side of golden brown than I personaly like for aesthetic reasons but still much better than the last time, the flavor was there and the texture was decidedly improved. A fry cut so thin could easy wind up limp or as brittle as a dead twig, but these were crisp enough on the outside to stand up by themselves and yet remained soft within. It had been so many years since I've had shoestring fries that I'd forgotten how difficult they are to eat, dip and dry the oil from, so keep that in mind if you order them . Still, I don't think I'll order the russets again in any form until the next harvest so I can see what they're like in all their glory. The fact remains that compared to some of the other options, and especially when paired with a truly tasty burger, they simply don't have enough flavor of their own, at least for me. If you dig that particular type of tater, I think you'll be very happy here. Purple (regular cut) - You know, I resisted trying these initially. They're the ones everybody raves about, and for some reason that set my mind against them, like I felt I was being pressured to try them or something. That and I was so fascinated by my super-gourmet fries and nonplussed by my girlfriend's normal ones that I momentarily forgot about the other options. Fry Guy said that while The Bourgeois is his personal favorite (I myself describe it as decadent to the point of bordering on evil), it's a bit much for everyday consumption so he generally favors the purple himself. I was finally in my element here. These had flavor and wonderful texture, very nicely crispy on the outside. And begrudgingly, I must also admit that the legion of devotees insisting the purple fries must be experienced with rosemary salt and dipped in garlic aioli couldn't be more correct. It's a damn near perfect combination, and a great distraction if your wallet or stomach can't handle the big B on that particular day. But it wasn't the big winner of the day for yours truly. Sweet potato (homestyle cut) - Now we're talking. I first tried sweet potato fries at Donn's Hilltop Kodiak Grill. They were featured on Diners, Drive-Ins and Dives and looked intriguing, so I decided to try them when a bunch of us headed up there after an opening-weekend showing of Zombieland (stopping on the way for Twinkies of course). I was not disappointed. The traffic-cone-orange color took a little getting used to and they could have been a little crispier, but the flavor was amazing. In time, I even got used to the dipping "sauce" provided (I'm pretty sure it was just whipped butter infused with cinnamon). The next time I saw sweet potato fries was in the freezer section of Walmart. What a freaking disappointment. I think I was able to choke down three before scraping the rest of the tray into the trash. Since then I've tried them when I come across them at different places, and it's been pretty hit or miss. Until now. I don't know where BFC gets their sweet potatoes. They aren't fluorescent orange, and in fact my dining companions questioned whether they WERE sweet potatoes until they tasted them. These fries couldn't have been more perfect, they were the exact contrast of crispy outside and fluffy inside that I look for, and the flavor was so good that I was glad I hadn't mucked it up with flavored salts. We came to the general consensus that these were best dipped in the sour Thai sauce. These are the fries that will keep me coming back to BFC. A pile of those in the thickest cut possible, one of those stellar burgers and a good beer sound like a great way to pass a summer evening to me. I'm happy to say that my previous complaints were addressed and resolved by this visit. I've come to terms with the fact that regular fries just aren't enough sometimes, and luckily BFC stands ready with other choices. Once again, and I know I keep harping on this, but try the burgers if you haven't, they really are something special. And while you're at it, take a friend or two and spilt a Bourgeois. They're expensive, ridiculous, excessive, and insanely decadent, but they're pretty freaking good. Besides, you're worth it, right? I know I am.